Hi all, is it Wednesday again already? I continue to be on a bit of a creative spurt and have started another new design on my wall. I really love the “working it out” part of the design process. 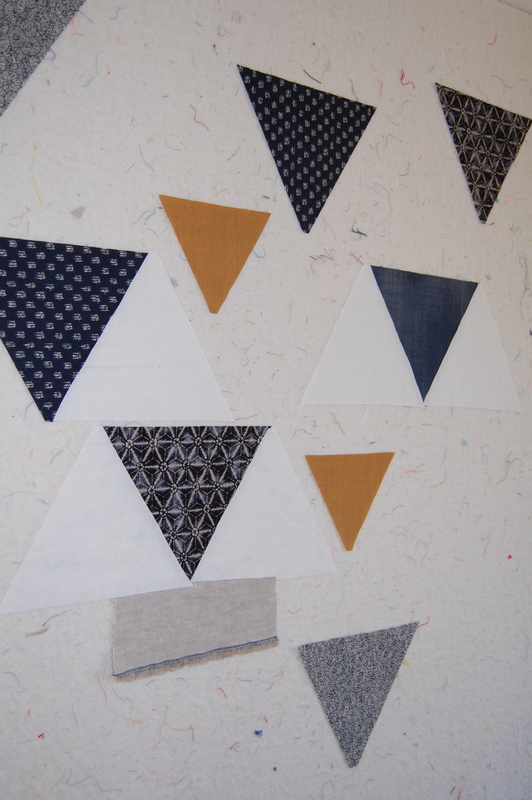 I narrowed down the prints I want to use and cut my triangles, now I am working on placement and deciding how big I want the quilt to be; how much negative space, how far apart to space the shapes, etc. I’m also “auditioning” that gray linen (selvedge not to be included) to possibly add in randomly. I have just a bit left over from my Oakshott quilt! Speaking of my Oakshott quilt, I got it all basted on Sunday and then realized I didn’t have the right thread color to begin quilting–???. I now have what I hope will be enough spools of Aurafil- Linen color on its way to me as we speak– thank you Pink Chalk, for your speedy service!! 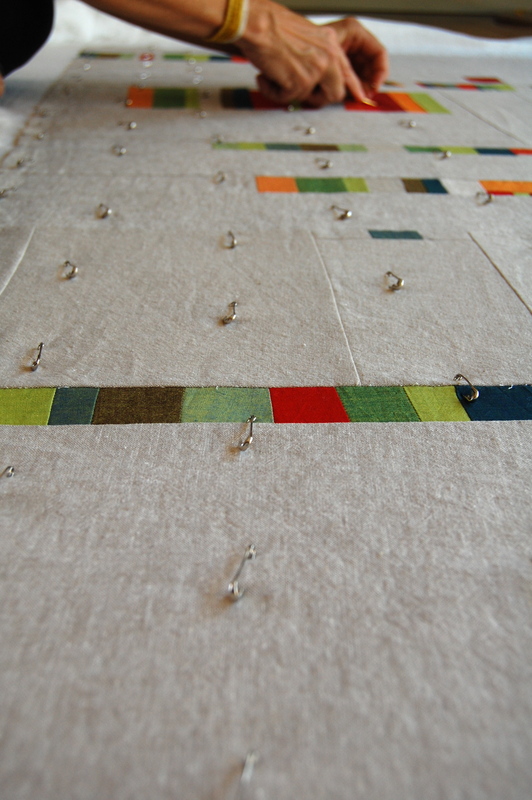 While I’m waiting I decided to make the binding for the quilt so it’s ready to go when I finish quilting. It’s so nice have that part done and just waiting isn’t it? 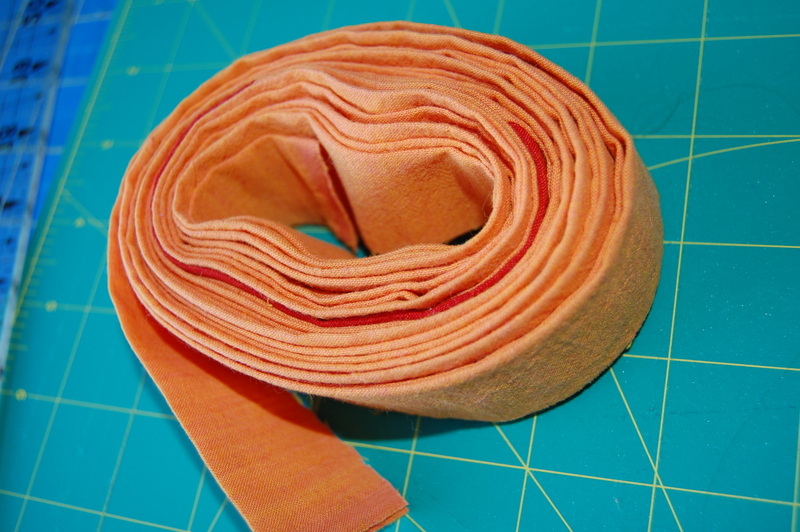 Since I decided to use Robert Kaufman Shot cotton on the back, along with some leftovers from the front, I had enough left over to create the binding in this beautiful orange color! 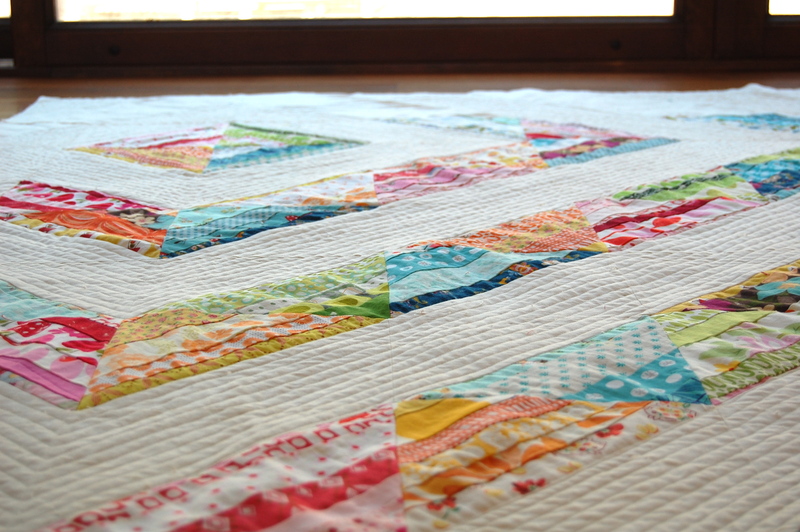 I’m pretty sure I’m going to bind up Miss A’s Scrappy Strings Quilt and then do a bit of hand quilting. My Mom is loaning me the first two seasons of Downton Abby, that should make it even more enjoyable. Thanks so much for the great tips on quilting and good tv series’ to enjoy while quilting. I love how much knowledge and experience there is in our little quilting/blogging community, and how generous you all are with it!! Just in case anyone is wondering, I sometimes will respond to your comment in the comments section and not via email directly to you…. and alas, sometimes I may just space out altogether and forget to respond (not often), but please know I read each one and appreciate you taking the time to comment! Hope you all are having a fabulous week!! I’m linking up with Lee’s WIP Wednesday today, go on over a check out all the fun! Karen, your pinned quilt looks beautiful. That is such an exquisite picture. so many great projects- that orange binding will be fabulous! All three are gorgeous. Everytime I see shot cotton fabric I swoon a little…I really need to get my hands on some! Beautiful quilts. Love that orange binding.